I seldom cook pork because... One, I don't eat pork as my digestive system cannot process red meat. Two, the husband is trying to avoid eating red meat as he has become more health conscious. 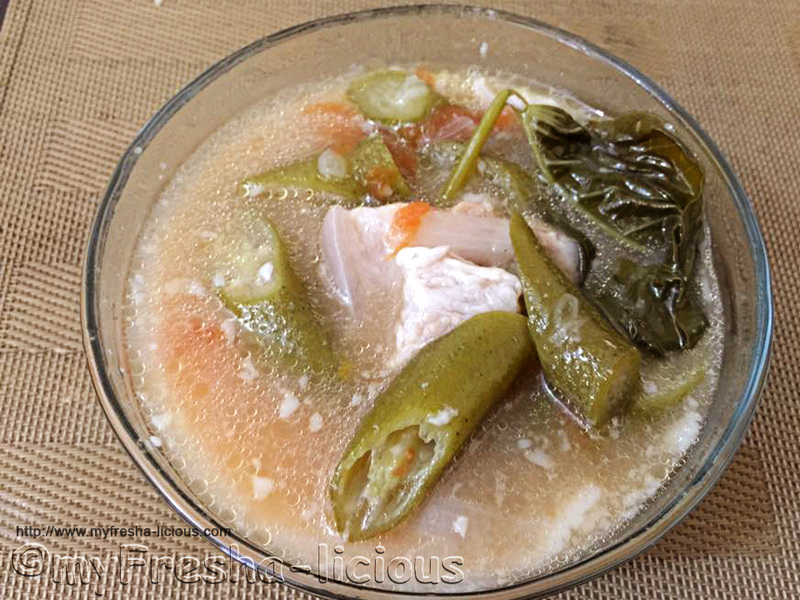 Sinigang is a sour soup dish that is native to the Philippines. It is a common dish among Filipinos living in the Philippines and abroad. The main ingredients usually varies depending on individual preference: pork, beef, chicken, or fish. For sinigang na baboy my family prefer to use the pork belly and the pork trotters ( I told you we like it fatty), some would prefer the meaty parts however, and the rib parts. The souring agents use for sinigang ranges from the use of tamarind, kamias (tree sorrel), guavas, santol, tomatoes, vinegar, and of course sinigang mixes which are the most convenient way to go in this modern times. Sinigang mixes are already found in all supermarkets, groceries, and even small sari-sari store nationwide and are also most often times available in Filipino or Asian stores in other countries. Kangkong (water spinach), okra (lady finger), labanos (radish), and sitaw (long beans) are vegetables that are commonly added. Whenever we had pork sinigang for dinner, Papi never failed to have his dipping sauce made of patis (fish sauce) or salt with crushed sili (red chilies) where he dipped the meat, I mean, the pork fat. My parents, my siblings, and I always enjoyed having sinigang na baboy. For whatever way you want to cook this sinigang na baboy and however you want to have it, be assured that it is a delectable dish you can enjoy alone or with your love ones. 1. Dump all the ingredients except for the kangkong and okra. Bring to a boil and simmer for at least an hour or until the meat are tender to your liking. Add more water as needed. 2. Throw in the okra and continue to simmer for a minute, throw in the kangkong and continue to simmer until the kangkong softens.